Passenger detection systems/light curtains (IPS) for escalators and moving walks are used for the automatic release of an escalator after actuation of an emergency stop. The presence of persons on the escalator is monitored in accordance with EN115. The light curtain consists of transmitter and receiver modules. 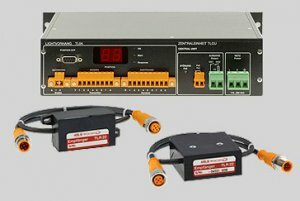 The modules are connected by cables (D- and E-version) or mounted on cables as chains (C- and MO-version). Different module types are available depending on the type of escalator. For all passenger detection systems, up to 99 modules per side of the escalator can be used. For longer escalators, two IPS systems are used accordingly. Currently, four different versions are offered, adapted to the escalators of all manufacturers. A fifth version is under development.